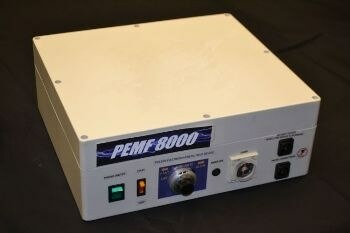 The PEMF 8000™ is by far the most advanced and durable PEMF device build yet. Only the best and most proven high quality components have been used to create this “State of the Art” unit to guarantee fast and long lasting results in a clinical environmentas well as in the private home. With up to 20000 Gauss, a Hz range from 1 to 100 and a pulse speed of about 100 nano seconds this device diggs deeper than any other PEMF device by charging the cells with a payload of instantly useable energy! The PEMF 8000™ fights chronic pain at its source by pulsing the body with an electromagnetic field. The electricity inhibits bacteria and enables the cells to repair the body, take in clean nutrients, and remove dangerous toxins more effectively! The PEMF 8000™ is the first of its kind capable of reducing or even eliminating chronic pain in a matter of minutes. Dramatic improvements in the body’s condition can be seen and felt starting with the first treatment and they continue for about 3 days afterward. Regular treatments create cumulative results, demonstrated by multiple cases of 75 – 100% recovery from permanent conditions such as frozen joints after therapy for several weeks. There is no better way to quickly improve your quality of life than with pulsed electromagnetic therapy through the PEMF 8000™. Leading Edge Technology Available Now!! Pulsed electromagnetic fields therapy or “PEMF”, is an astounding and innovative way of putting all sorts of health issues – especially chronic pain – into permanent remission. Mimicking the earths’ electromagnetic fields that are fundamental to all life, the device that’s at the leading-edge of this revolutionary therapy is the Phoenix Series of PEMF machines. These clinical-grade and professionally designed machines produce safe, powerful and restorative electromagnetic pulses that help every bodily function and moving part, recharging the body on a cellular level. The PEMF 8000 is especially effective for treating chronic pain in areas that are hard to get to. This technology is FDA approved uses in several bone and tissue repair protocols. The powerful fields produced by the PEMF 8000 speed up the recovery process for all sorts of damaged parts of the body; including reduced inflammation and numerous applications for reversing depression and increasing our sense of well being. PEMF therapy also has multiple applications relating to detoxification: the PEMF 8000’s pulses improve circulation and improve oxygen flow throughout the body – providing the energy and stimulation to your body’s natural regenerative systems, especially stem-cell production. How does PEMF therapy work? Every cell contains tiny electrical batteries called mitochondria. These delicate and essential structures help our cells with the many functions they maintain every single second. One of the vital processes that mitochondria execute is producing energy. By stimulating and re-charging these batteries and helping the cells’ production of Adenosine triphosphate (ATP), energy transfer is enhanced. By using pulsed electromagnetic fields therapy, more energy can be delivered to specific locations in the body. The result is more effective cellular repair and better tissue repair. The reason PEMF is becoming so popular as an effective, non-invasive and side effect-free antidote to pain, is because it directly affects nerve cells – which tell our brain that our body is experiencing pain. This has delightful anti-inflammatory implications, which has real value in minimizing pain. This also affects flexibility – especially when treating stiff and inflamed muscles. PEMF treatment invariably increases the range of motion that can be achieved, results are usually immediate. For bone fractures, PEMF is especially useful in healing non-union fractures. This is because electromagnetic waves are the earths tool to cause biochemical changes which result in an increased speed in bone formation. PEMF therapy has also been found to relieve depression and other well being conditions. It’s also been applied to everything from arthritis, to cancer, to heart disease, Alzheimer’s disease, Parkinson’s disease, to multiple sclerosis, autism, diabetes, and many other ailments. The controllable and safe PEMF 8000 device can be used in any position: sitting, lying down, or standing up. There are plenty of options on how it can be used, so it’s helpful to look at the instructions provided. The Phoenix is simple to operate, you’ll have the hang of it in no time. The PEMF 8000 comes with a dial for intensity, a timer to ensure that exactly the right amount of time is spent in your treatments. And of course an on/off switch. The delivery method for the treatment is called a ‘butterfly loop’. As many things in life, when using the PEMF 8000 Phoenix, sometimes ‘less is more’. This mindset also carries the additional benefit that the treatment of any particular condition does not take long. Using this professional-grade PEMF 8000 device provides the equivalent of a deep tissue massage (on steroids), so it’s important to condition the body to the electromagnetic pulses by building up duration over time. This is why 15-20 minutes per treatment is completely sufficient. Additionally, when the loops are first placed on and around the body, the intensity and frequency should start low, and then be turned up steadily to a therapeutic level. As the loops are moved around the body and pain sites, the electromagnetic pulses will often find pinched nerves or sciatic problems. This will be indicated by a bit more tension in the area, and the PEMF waves will be felt more strongly. When the loops are working on the body, it is the transference of electrical pulses that create a nerve reaction – a gentle twitching-like sensation. This will be involuntary, but it means that it’s right where it needs to be – especially with muscles that are inflamed or have gone into spasm. Three to five minutes at a particular site on the body is usually sufficient. The truly astounding thing about electromagnetic pulses produced by the Phoenix Series is that they penetrate tissue and bone – all the way down to the cellular level – and jump-start cells’ restorative processes – a remarkable three-dimensional way of treating conditions. The PEMF 8000 Phoenix devices are extremely versatile – it’s designed to treat a broad range of conditions in the human body. While there are other PEMF machines available, they don’t come with the durability, reliability, effectiveness and power as the Phoenix . This powerhouse can work from around 1000 gauss to a maximum field intensity of around 20,000 gauss (2 Tesla), with a frequency range of 1Hz to 50 Hz. This means more of the targeted and penetrating pulses hit their target and perform the desired therapy. For complete body rejuvenation, cellular repair and freedom from chronic pain, get plugged into the PEMF 8000 Series of devices – it’s the leading light in the remarkable, ongoing story of the PEMF therapy revolution.